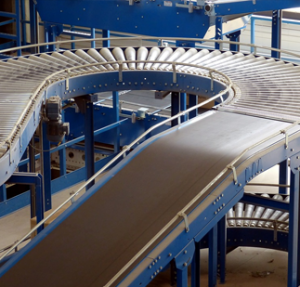 Food handling conveyor belt systems utilize a number of proprietary solutions. There are scrapers in place to clean waste. The actual belt is finished in chemically neutral plastics, stainless steel, and soft rubbers that are easy to clean. It’s a hygiene-oriented work line, but one that relies on well-regulated drive components, for these parts underlay the cleanliness ideal. Conveyor pulleys in this changeable environment smoothly deliver the muscle for the moving chain of parts, transporting confectionary, meat, dairy products, and every imaginable form of foodstuff. But what makes the difference between a standard series of conveyor components and food preparation assemblies? Let’s explore these specialty systems to gain some insight into the matter. Foodstuff is a curious product to handle. On the one hand, it’s protected by exemplary sanitation guidelines, but each product carries its own set of unique threats. First, there are environmental hazards. The lagging of the conveyor pulleys must be fabricated from engineered plastics and rubbers that can withstand temperature extremes. The lagging should be designed to cope with such extremes. Next on the troublemaking list is the chemical factors. Certain foods are messy and liable to drip strange fluids. Acid-loaded blood and caustic oils are just two examples of this caustic threat. Food grade lagging is therefore built tough, designed to function without submitting to the material fatigue caused by extreme temperature changes and nasty fluid deposits. A soundly established food handling routine is essential if all sanitary guidelines are to be observed within a food processing plant. This mandated series of regulations obviously includes the long assemblies of mechanical parts that transport the food. Comprehensive cleaning programs take the following maintenance programs all the way down to the conveyor pulleys and beyond. A semi-modular build id preferred here as it exposes hidden surfaces, places where bacterial growths could prosper. Special detergents and high-pressure water hoses eliminate such threats, but the bearing housings of the pulleys must be sealed if the sanitation cycle is to be effectively conducted. Additional modular aids include special tip-up tails, levers that remove the tension from the belt. Tool-free designs enable such deep-clean tasks to be accomplished quickly and productively. The processing of slaughtered meat is moist, and the conveyance of processed food employs a range of food-preserving temperature extremes. The conveyor system, as established in the food industry, is designed with these twin factors in mind and provides the high-quality components that function well in this scenario, all while submitting quickly to exhaustively conducted cleanliness regimes.